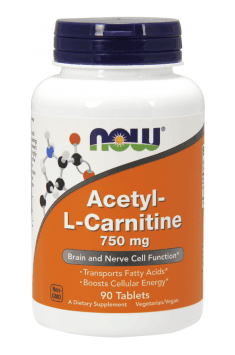 Now Foods Acetyl L-Carnitine is a dietary supplement containing acetyl-l-carnitine (ALCAR), which due to taking part in many metabolic processes is considered to be a substance with an action similar to vitamins. He plays in the body a huge role in burning fat, and at the same time has a number of health-promoting, nootropic and antidepressant properties. ALCAR (acetyl-l-carnitine) – acetylated and also metabolically active form of the amino acid L-carnitine. Its main function is to facilitate the transport of acyl-CoA (an active agent in the catabolism of fatty acids) to the inner space of the mitochondrion during the oxidation of fatty acids. ALCAR transports long-chain fatty acids (acyl-CoA molecules comprising chains longer than 10 carbon atoms) between the cytosol and mitochondrion, where it is involved in the beta-oxidation, which leads to the production of energy. It also participates in the removal of mitochondrions medium- and short-chain fatty acids, having of toxic effects in excess. The ability of L-carnitine for the attachment of the acyl groups is sufficient to fulfill a role in detoxification processes. Studies suggest that the use of ALCAR can improve insulin sensitivity, and stimulates the use of long chain fatty acids as an energy source. All this makes the metabolic parameters improved, which increases the efficiency of fat burning, and helps to improve body composition. Apart from its metabolic role, ALCAR demonstrates exceptional neuroprotective, neurotrophic and neuromodulator properties in the central nervous system (CNS), and therefore – it can play an important role in combating a variety of disease processes. It crosses the blood-brain where it shows an affinity to GABA and glutamate medium, and provides acetyl groups for the synthesis of acetylcholine – a neurotransmitter responsible for, inter alia, the contractility of skeletal muscles, stimulating the parasympathetic part of the nervous system, as well as the ability to learn and remember. Moreover, it accelerates energetic brain metabolism, and increases noradrenaline and serotonin. Acetylcholine (ACh) is a chemical neurotransmitter stimulating the parasympathetic nervous system, which has antagonistic properties in relation to noradrenaline, which stimulates the sympathetic nervous system. The synthesis takes place at the ends of the cholinergic neurons as the result of the merger of choline and acetic acid residue (acetyl radical) with the participation of the enzyme choline acetyltransferase, which transfers an acetyl group from acetyl-CoA to choline. The rate of synthesis of the above largely depends on the concentration of choline and the availability of acetyl groups, so it is worth to combine ACLAR with various forms of choline (eg. bitartrate, alfosceran, citicoline, lecithin, DMAE). Acetylcholine is a neurotransmitter that is gaining recently a quite big interest and popularity, and all this because it is responsible for the correct communication neuromuscular and a motor function (which is important for athletes who need to demonstrate their full speed, reflexe and coordination), as well as determines memory, attention, association and science functions, and to raise its level increases the quality tests of memory and intelligence. ALCAR also reveals neuroprotective effects, and is a quite powerful antioxidant. It protects both DNA and cell membrane against free oxygen radicals. These properties can be used in the treatment of a neurological condition of depression and deep stress. Researches also suggest that ALCAR may be helpful in the early stages of Alzheimer's disease, states of depression and anxiety, and increases resistance to stress. ALCAR may be useful in the treatment of infertility in men. Studies have shown that it improves the quality of sperm, and stimulates motility. Interestingly, researches also demonstrated the activity of carnitine, associated with sensitization of the androgen receptors (AR) to testosterone, and an increase amounts of these receptors. Thanks to its antioxidant properties, it may accelerate the regeneration of damaged muscles, by speeding up the process of elimination lactate. ALCAR, by lowering a LDL and triglycerides level, has a positive effect on the health and general condition of the circulatory system, which minimizes the risk of, among others, atherosclerosis and hypertension. In addition, it has been shown that carnitine improves systolic and diastolic functions of the left ventricle of the heart, increases the efficiency of myocardial infarction, and improves ECG. In summary, the dietary supplement Now Foods Acetyl L-Carnitine exhibits a wide range of health-promoting properties, inhibiting the aging process, improves the function of the brain, and increasing the proportion of fatty acids in the form of energy, at the same time protecting glycogen stores and amino acids. Accordingly, it is recommended to both athletes, and each person running active and stressful life. One capsule 1-3 times a day if needed. Supplementation with L-carnitine in combination with a balanced diet and appropriately selected physical activity helps to reduce body fat. Acetyl-l-carnitine also supports cognitive function and adds energy, so you should take it before increased physical or mental effort. In addition to that, you can increase the effectiveness of the product by adding preparations containing alpha-lipoic acid, choline, or caffeine. Olive leaf extract. Helps strengthen the immune system and improve health.